From the most popular Breakfast Blend to extravagant offerings like Rain Forest Nut and Cappuccino, you will enjoy a wonderful cup of coffee every time. A variety pack is available in this category. Dark Magic, Jet Fuel, Black Tiger, Double Black Diamond! 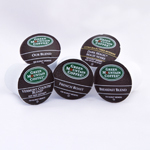 These names conjure up a thought of dark richness for those that like their coffee with a kick. Currently 10 coffees to choose from in this category. Have fun with Wild Mountain Blueberry or Chocolate Glazed Donut! This category would not be complete without the standards, Hazelnut and French Vanilla. 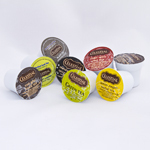 Nine coffees and a variety pack to choose from. 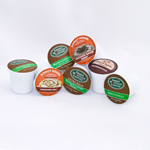 For those who love the taste but not the jitters! 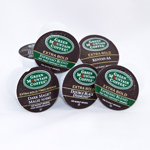 Choose from our most popular regular and extra bold blends but with the caffeine removed. French Vanilla and Hazelnut available as well! Freshen up the office with offerings like Mandarin Orange Spice, Lemon Zinger or the ever popular Green tea in regular or decaf. We offer a wonderful variety of regular and herbal teas. 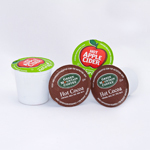 Rich, delicious regular hot cocoa or Cafe Escapes specialty cocoas! Cider made from real apples! Yummy.